If you are a Hillingdon resident,you have no doubt seen the story in the Gazette concerning the demonstration organised for Saturday 25th February to highlight the threat to Lake Farm Country Park by the council decision to build a school on the green belt land. Local people met up at the site on a protest organised by Hayes & Harlington Labour MP John McDonnell, where we were advised that we would be marching to Hayes Town with placards and making our voices heard in an attempt to get the Council to listen to our community over the controversial decision to go for planning permission on one of the few remaining green areas close to the town centre. 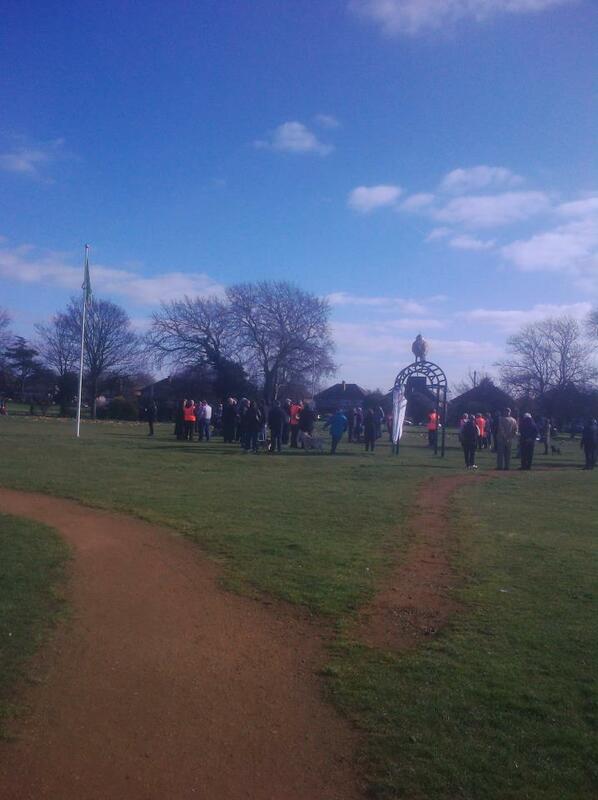 I arrived just before the 11am start time to see a number of local councillors and familiar campaigners assembling by the Skylark statue. 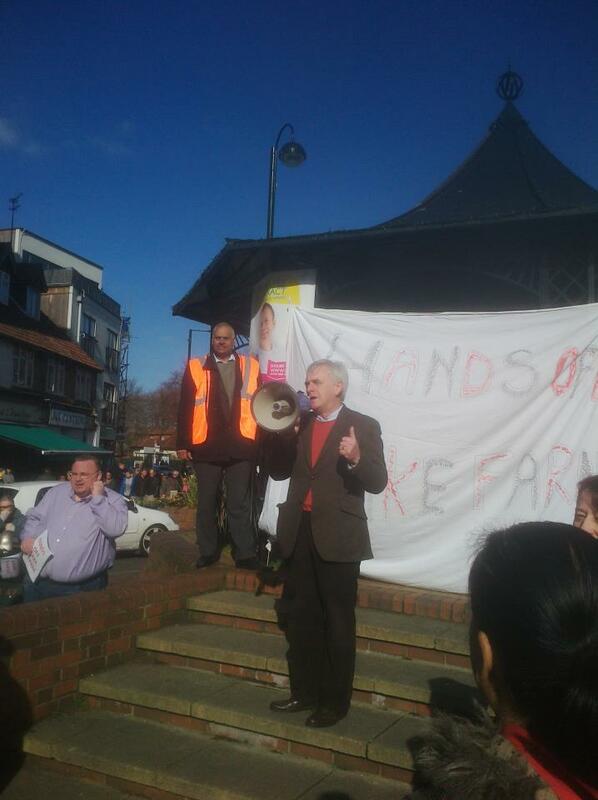 John McDonnell unveiled a megaphone, and advised us that we would be making a move towards the town shortly, escorted by a number of Marshalls in high res bibs and sporting taped on ‘Save Lake Farm’ logos. By the time we started to move off, around 50 or 60 people had gathered, including all the councillors from the affected Botwell ward and two out of the three neighbouring Townfield councillors. We marched past the crumbling remains of the old Hayes Pool (One of the alternative sites for the school proposed by the protestors) and on to the pavilion at the top of the pedestrianised zone in the town centre. The chants of ‘Save Lake Farm’ drew response from car horns and waves from windows, and the Gazette photographers turned out to take photos for the latest edition. 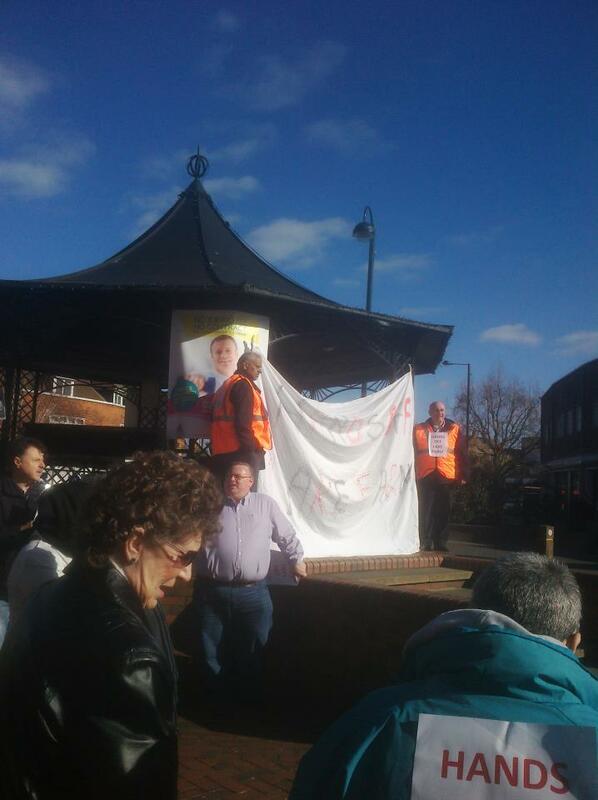 Upon reaching our destination, the sheet from the front of the parade was hoisted up in front of the pavilion by the familiar figures of local Labour group leader and councillor, Mo Khursheed, and long time local campaigner Peter McDonald. 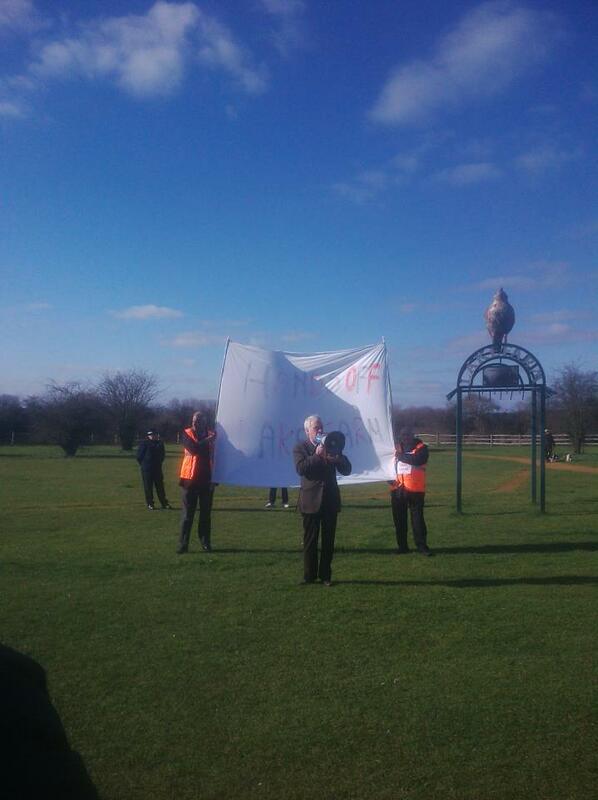 John McDonnell proceeded to give a speech about how the green belt in the south of the borough needs to be preserved,and that the local community needs to come together to stop the council from removing the last vestiges of green from the Botwell and Townfield wards of Hayes. It was also pointed out that discussion on the future of Lake Farm at the latest Council Meeting was reserved for the second part of the assembly – This is where Councillors on the cabinet discuss matters in private and without the public being made aware of their conclusions. The excuse used for this was that there were delicate financial matters involving the tendering for construction of the school that could not be made public, yet when it was suggested that the financials be removed and just the outline plans be submitted for scrutiny this was dismissed out of hand. Mr McDonnell advised that a Freedom of Information request has now been submitted. With the crowds now gathering to see what was going on, I approached Peter McDonald with the petition forms on the board that I had brought and suggested that we make the most of the attention that the protest was generating. An announcement over the tannoy from the attendant MP, and a queue promptly formed to sign the paperwork to register the resident’s dissatisfaction with the plan. 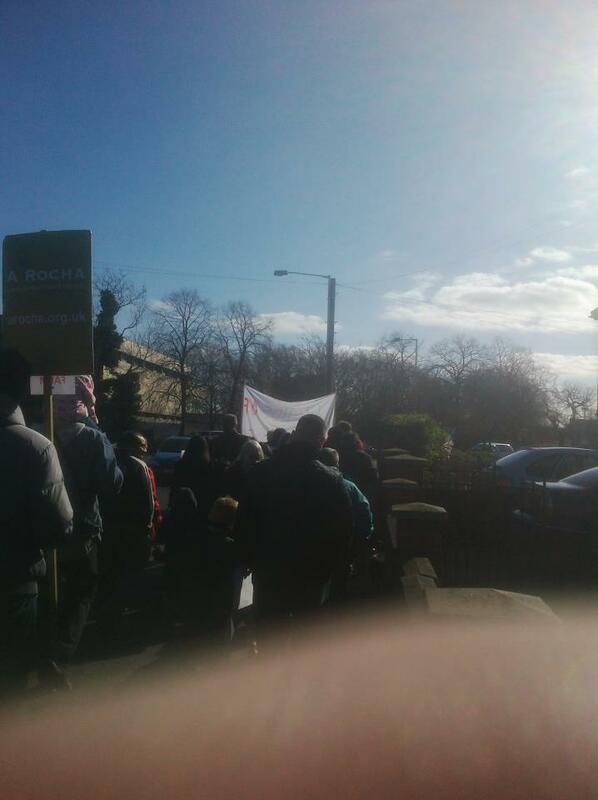 I had 20 sheets when we started, I only had 2 left when the board was retrieved at the end of the protest. Hillingdon Council are riding roughshod over our community with this idea of building on the green belt under ‘exceptional circumstances’. We have the brown field sites in Hayes to comfortably site a new school – Alongside the pool already mentioned, there is the EMI site (Which has now quickly been announced as a site for flats), the levelled area opposite Hayes & Harlington National Rail station, plus the old coal yard at West Drayton. This entry was posted in Local issues, The environment and green belt. This turned it into a ‘brownfield site’ & is now a housing estate – Not a school. Ironically with West Drayton providing the whole of Hillingdon Borough’s quota for housing, a schooll will be needed here again soon. Is the school in Sidmouth Road Ruislip Manor going to have a similar fate, as this was also ‘Green Belt Grab’ with the same reasons/excuses tendered. 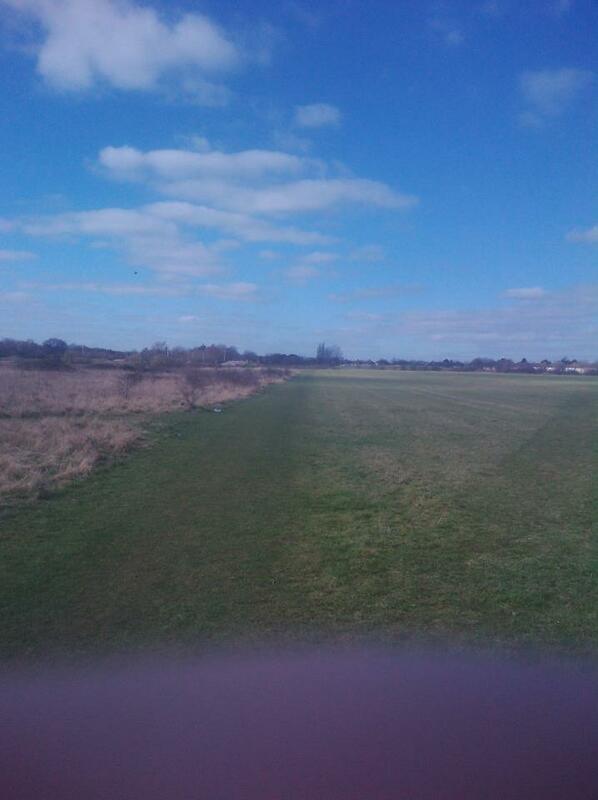 Our ‘Green Belt’ is taken by stealth, using unproven reasons & the encroachment goes on & on. Why is it then, that when ‘Green Belt’ or agricultural land is taken in this manner, that it never gets restored to it’s original status when the ‘overwhelming need’ is proven to be a myth? Also the ministry of defence has sold of a number of RAF sites for housing, instead of returning it to agricultural status. This would not have been difficult as most buildings on Defence Bases are of a prefabricated or temporary modular structure. Unfortunately, both our National & Local Government are just treating our ‘Green Belt’, ‘Green Chain’ & Agriculturaol land as ‘cash cows’. Can we trust any of them any more?